Helpful Products To Build Your Brand, Business & Sales! Lisa’s New Book,”Your Employee Brand is in Your Hands“, Available on Amazon in Both Print and Kindle Versions! Whether You’re a Seasoned Professional in the Workforce or a College Student, Read This Book if You Care About YOUR Career Success! Highly successful executives unanimously agree that a key component for achieving extreme career success is to create, manage, and promote your own Personal Leadership Brand at work and within your industry…and it’s never too soon or too late to start! But how do you create one to stand out? And what does Personal Branding even mean? Lisa knows! She is hired by well-known companies across the nation to conduct workshops about this for their employees of all ages. So if you’re ready to separate yourself from “the crowd”, and reach the level of career success you’ve only dreamt about, her book will help YOU! Included: 3 Easy Exercises to Create & Define Your Own Personal Leadership Brand! Excel Beyond What You Knew Possible! Lisa’s Popular Third Book Available on Amazon in Both Print & Kindle Versions! 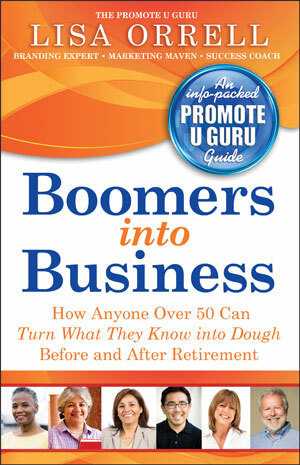 Are You a Boomer Seeking Ways to Generate More Income Now & Into Your Later Years? Yes? EBRI.org Retirement Readiness Rating Report: 47.2% of older Boomers (56-62) are at risk of outliving their retirement savings. And 43.7% of younger Boomers (46-55) are at risk of not having enough money for basic monthly expenses when they retire. Boomers into Business was written to answer that question! You will learn how to take what you know and turn it into dough. With the help of this book, you can improve your financial future; regardless of your education level, career experience or business background! And for Boomers already self-employed, you’ll learn how to expand your business and offerings to generate more on-going income now and into the future! Over 15 Experts Have Contributed Strategies to Lisa’s New Book! Do You Want to Attract Media Interviews & Mass Media Coverage to Build Your Brand Awareness, Sell Your Products/Service & Increase Your Income? LISA’S SPECIAL LEARNING GUIDE EXPLAINS HOW! Order the “Promote U Thru PR Learning Guide” Today! SPECIAL SALE PRICE ONLY $17! Normally $27! Lisa has loaded this with all the details she teaches her clients, including strategies she’s used to land 100+ media interviews for herself! How to Control Your Media Interviews to Shine! ALL OF THIS FOR ONLY $17!!! It costs much more than that to attend her seminars and workshops that cover this info! Lisa’s Book is a Must-Read for Gen Y Employees & Gen Y Entrepreneurs! If you’re a Millennial (aka Gen Y) employee or business owner, developing your “leadership mindset” needs to start now! And, the path to becoming a successful leader (regardless of your current role in the workforce) includes developing your Personal Leadership Brand right away…and Lisa’s book explains how! Learn Tips to Make Your Blog Better for Only $9.99! This amazing e-book was written by blog marketing expert, Kiesha Easley (founder of WeBlogBetter.com). It’s for people who already have a blog and want to improve their content, traffic, and features (like what powerful plug-ins you should add?). AND there is also great info for beginners who don’t have a blog but are seeking guidance on how to start one–easily and effectively. It’s ONLY $9.99 so order it today!